Udaipur: As part of ISA Activity, students of grade IV participated in “Let’s know our heritage” activity. Students prepared beautiful scrap book and shared important information on the famous heritage sites of the world. ISA Coordination Ms.VineetaPareek also shared the importance of heritage in the student and appreciate the students for their participation in the activity. Ryan International School, Udaipur Celebrated the 122nd Birth Anniversary of the great NetajiSubhash Chandra Bose in the School premises with lot of respect for the great soul. The day was celebrated with many competitions where in students presented patriotic dance, songs, beautiful self composed poems. 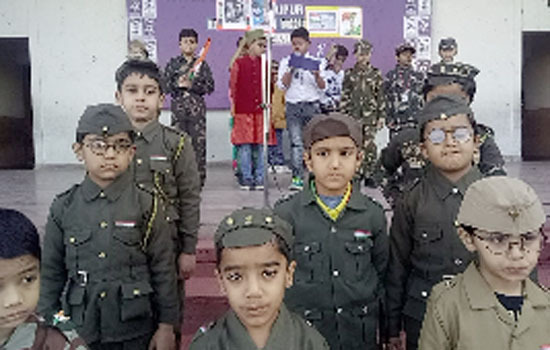 Students came in the attire of Indian Soldiers to commemorate the occasion. Students got to know about the great Indian Nationalist and the Patriot of the country which enhanced their knowledge. Education exchange programme is one of the effective ways to challenge the students to develop a global perspective. As a part of this programme, a Skype session on ISA activity- Traditional Delicacies was conducted for the Primary students of Ryan International School, Udaipur with their Nigerian counterparts. A live session on the preparation of Abacha (a traditional Eastern delicacy of Nigeria) was shared by the students and teachers of Imperial Gate School, Nigeria. The session helped them gain and understand the variation in food items according to the taste and culture of a particular country along with sharing attitude. Principal appreciated and congratulated the students and teachers for their efforts in enriching global experience.